It’s all about the Idea! You could have the greatest production team, the best global agency, and an amazing client. But just remember this does not mean anything with a bad idea. Let me give you an example of a simple idea that was a pure genius. Do you remember the power cut during the third quarter of Super Bowl 2013, which caused the lights to go out for 34 minutes? The sandwich cookies brand, Oreo was quick to think in this situation and posted on social media ‘‘Power out? No problem. You can always dunk in the dark’. It revealed a simple picture of an Oreo cookie in a dark room. You could argue how Oreo was a great success compared to the other brands that paid for a spot in the memorable, global game. However I disagree with this theory as great ideas also went into all of those other commercials even If they didn’t think of it in 10 minutes. For example the Budweiser commercial- brotherhood, it worked because of the idea behind it. It was a surprising advertisement away from the typical alcohol ad. It told a warm, hearing story between a man and his horse that were separated, yet three years later they were reunited. It engaged the audience from the start as we questioned what the advertisement was for as it had a cinematic feel to it. According to SJ Insights the number of ads that adults are now exposed to across all five media (TV, radio, Internet, newspapers and magazines) is about 360 per day; of these, only 150-155 are even noted, and far fewer make a strong enough impact to be recalled, make an impression, and ultimately, make a sale. It is vital that there is a strong idea behind any campaign; if your ad is noticed out of those 360 per day then you are on your way to success. One campaign that has stood our for me this week as my bus goes past it everyday is a campaign that was advertising Mardi Gras. It was the simplicity that made me love the outdoor advertisement. 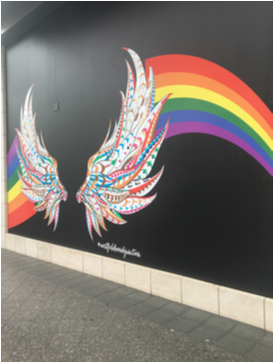 Instead of using a billboard outside Westfield in Bondi Junction they have simply made a mural to advertise Mardi Gras using a colourful set of wings, which, people can stand next to and take photos. This always grabs my attention, as the advertisement looks different every time I look at it with different people laughing and smiling, whilst taking photos with the wings. It is memorable as it made me feel happy. You could spend fortunes on a TV commercial or a print ad but if the idea is not relatable or doesn’t make your audience feel an emotion then it gets lost in the world of advertising. Just remember the greatest ideas are the simplest. Previous PostAd Students to develop Snapchat campaign ideas for RUOK?Next Post3 great ads I had nothing to do with!